6 December 2001. Thanks to BC. 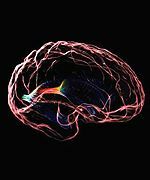 Scans of 7,000 healthy people around the world are being used to produce a 3D atlas of the human brain. A group of brain cartographers is creating the most detailed and sophisticated computer atlas of the human brain ever assembled. When the $15m (ï¿½10.6m) project is completed, the map will display the brain's anatomy and models of how it functions. "We don't understand the human brain in great detail yet," said Arthur Toga, director of the Laboratory of Neuro Imaging at the University of California in Los Angeles (UCLA), US. 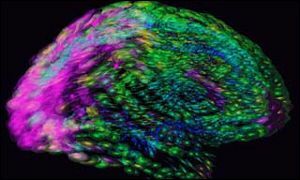 "The objective is to try to create a map that describes not only the brain's structure but its functions in a comprehensive way," he told BBC News Online. "We also have to understand how different brains are across individuals, so that for example we can know when they are pathological versus when they are normal," he said. Until now, the brain map that has served as a model for the billions of brains on the planet has been based on that of a 60-year-old French woman. Dr Toga said this model was simply inappropriate in terms of representing the entire human population. "All brains are as different as our faces," he said. "You and I have eyes, ears, nose and a mouth. But the shape and position of each of those features is different and that is just structurally. "If we think about how complex the brain is in function, that variation gets even more extreme." From his fourth floor office in Los Angeles, Dr Toga has enlisted the help of dozens of scientists from around the world, including the UK, to help draw up this new brain map. Brain scans of 7,000 healthy individuals from nine different countries, representing a cross section of the global population, are being put together. When finished, scientists and physicians will be able to use the 3D atlas online to compare, or contrast, all sorts of information about the human brain. Speciality maps will also be categorised by age, gender, genetic background and family history. "Many neurological or psychiatric conditions produce subtle differences in the brain and in order for us to be sensitive to those differences we have to fully understand what the brain looks like when it is normal," said Dr Toga. "And in order to do that we have to have examinations of a large population of individuals, and the ability to be sensitive to those potentially slight differences is important." The brain map has already been used to show how an individual's genes influence their brain structure and intelligence. Scientists at UCLA collaborated with researchers in Finland and used MRI scans to compare the brain matter of 20 identical twins and 20 fraternal twins. The findings, published in the journal Nature Neuroscience, show that the amount of grey matter - a measure of the density of brain cells found in the outer layer of the cortex where information is processed - seems to be highly determined by genetics. The amount was much more similar among identical twins, who share 100% of their genes, than between fraternal twins who share far less genetic material. "The frontal cortex and language cortex were very strongly determined by genetics," said Dr Paul Thompson, assistant professor of neurology at UCLA and one of those involved in the brain mapping project. "Those areas were almost indistinguishable in identical twins. "The frontal cortex is associated with problem solving and IQ, while the language cortex is associated with speech production and language comprehension," he said. Dr Thompson suggested these results might begin to explain why patterns of intelligence seemed to run in families. "The puzzle was people knew some features of intelligence were inherited, but no one knows why that is. This builds a bridge between those two observations. " Dr Toga said this new genetic brain mapping approach was already being used on relatives of schizophrenic patients and individuals at genetic risk for Alzheimer's disease by screening them for early brain changes. "One of the things we have begun to learn from this map is that there are trends or patterns to brains that allow one to be sensitive to schizophrenia or Alzheimer's. "We knew the brain was different but the signature of what that brain looks like has become apparent to us by using these population-based image programmes. "Before that we didn't really know. "You would see one particular patient that would have this particular problem and another patient that had this particular problem, but by combining all this in a statistical way we almost gain a characteristic of this disease that can be seen with imaging," he said. It is predicted that in a couple of years, clinicians from around the world will be able to interact with the 3D atlas online in order to diagnose and treat patients with greater speed and accuracy.